1. To walk, go or travel unsystematically, especially over a wide area, usually prompted by restlessness or curiosity. See also, Vagabonding – wander about without a settled home, Wandering– ramble without a particular purpose, Rambling – pleasant, carefree moving about with no specific destination. In December 2011, I quit a PhD in Geophysics, and moved all my belongings to storage. I have not had an official address since (or filled out a W2 form, or paid taxes, for that matter). For most of 2012, I was on foot … first to India, then on the Pacific Crest Trail. I reached the trail’s terminus on September 29th, and was reunited with my truck on October 1st. I have been vagabonding – living in my truck – since that day. Below are stories related to living full-time off-the-grid in the 32 square feet I call Home, the Cat-mobile … Check out also @roamingbobcat on Instagram. Roaming tracks – roaming tracks for the past few years (maps of where I have been). My 32 square foot home – the living room – What goes in the cab (treasures and crafts!) – from the 2015 setup. Repack and Go – What the truck looked like “exploded”in 2013, on my way to New Hampshire. So, what IS the highest art of living? … – To live an ordinary life in an extrordinary way, or to live an extraordinary life in an ordinary way, that is the question. All Hail the Power of the Mighty Flu – and a bonus story – What being a sick nomad feels like, and about a strange man fervently praying next to my truck-home. The Ugly Truth about Living Life to the Fullest – Because being a full-time nomad is only fun about 99% of the time. Also about Slab City, Sedona and Alexander Supertramp. Are you feeling the Shift? (also about hospitals and mechanics) – Esoteric musings while I was separated from my beloved Catmobile. Trail journal from the most beautiful highway in the world – Driving up to Alaska on the Alaska Highway. Fearless – 5 secrets to survive your new love in a tiny home – Some things I learned from sharing my truck-home with Jimmy James of Maine for a few months. What happened to the professional marijuana easy gravy train? – I have worked in the Marijuana industry to finance my vagabonding. Here is a summary of my experiences. 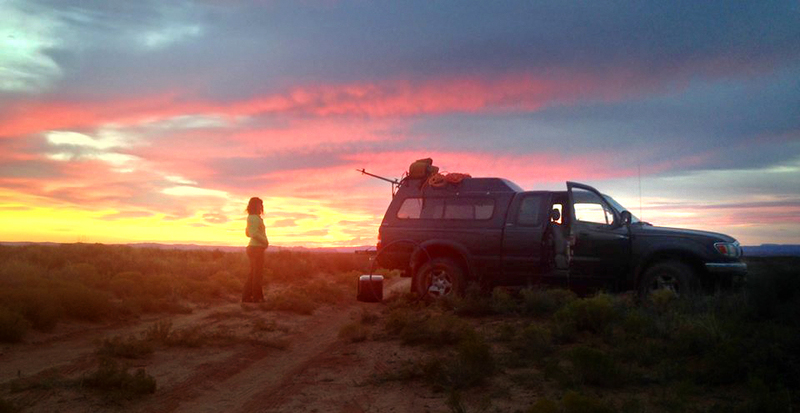 Lunacy – Sometimes, being a woman alone living in my truck can be scary, especially on a full moon. Cottonwood Sage, Sedona Red – About the potency of Sedona’s energy and why I constantly roam away from and back to it. Coyote – a Story of Life and Death in the Sedona Desert. Written on the anniversary of the death of two desert friends of mine. Whose room is this and how the hell did I get here? – Dropping in on a parallel life path. I pee in a Tupperware – An almost-poem about rain on the truck in the desert. Slapped with blessings – How I finance the dream. The Life I Chose – A peaceful morning contemplation about my off-the-grid life. Three months until the Appalachian Trail – Written live, looking at Thunder Mountain, from my tailgate. A Hopi Ghost Story – About the night I parked my bedroom too close to the entrance to the Underworld. Ridiculous Job Hunting – How to find work when you live in the middle of nowhere … let it land on you.